In a quiet yet colorful room, the smooth voice of a yoga instructor guides spandex-clad attendees to a peaceful place while cats of different sizes roam freely all around them. 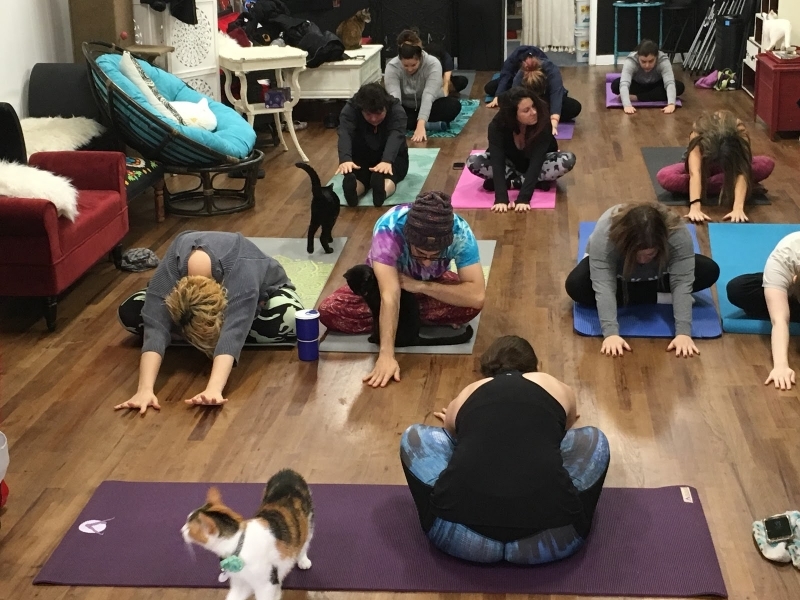 In any other yoga class, the presence of cats might raise an eyebrow, but at the Shabby Tabby Cat Café, located in Sayville, NY, their attendance adds to the ambiance. The Café holds weekly sessions called “Yoga with cats,” in which a small group of people come to relax and practice the activity while enjoying the presence of cats. First-time event attendee and yoga beginner Kelsey Renz found the experience to be pleasant. “I think it makes you feel better and it’s fun to know that they are hanging out on the mat with you,” Renz said. Yoga uses a range of postures, breathing and concentration techniques to connect the body to the mind. The spiritual activity was originally practiced in different religions ranging from Hinduism to Buddhism. Yoga instructor Victoria Betanzos thinks the activity gives way to something distinctive and entertaining. “Yoga with cats might not necessarily bring ease and tranquility to some, but it’s definitely more fun,” Betanzos said. According to research done by Harvard, yoga serves as natural anxiety relief, which can help deal with both depression and stress and helps develop inner awareness which could then lead to a better body image. “When you mix the two [yoga and cats], we think it could be very beneficial to those suffering from anxiety or high blood pressure. That’s what we’re hoping for,” Ryan Shea, owner of the Shabby Tabby Cat Café and a registered nurse, said. A SUNY Buffalo study showed that solely having pets around reduces stress levels, but levels get even lower when humans take the time to interact with them. These interactions can range from talking to petting the animals. But, to acquire all of its perks, an hourlong yoga session is not enough. Dr. Jonathan Smith, a professor of psychology at Roosevelt University and the founding director of the university’s Mindfulness Initiative, believes that practicing yoga once a day will show better results. “Our research shows that regularity of [daily] practice is most important, more so than length of session,” Smith said. Yoga itself is a profitable business that stemmed from what essentially was solely a religious practice. According to Statista, the yoga industry’s revenue in 2015 amounted to $9.09 billion, and it is expected to jump up to $11.56 billion in 2020. In relation to religion, Dr. Smith believes that the activity can be practiced without any direct link to Hinduism, just as “one can play the organ in a church without being a Christian.”. “However, most advanced yoga instructors are closet Hindus,” he said. The Café, which describes itself as a “big foster home for homeless cats” makes sure to put the animals’ safety first by allowing twenty people at a time in the building. Attendees are not allowed to bring in their own animals and have to ask for permission before picking up the cats. All of the cats present in the Café are adoptable and come from the Golden Paw Society, a cat rescue group that pulls cats from kill shelters. Adoption forms are available at the front desk for anybody willing to bring a furry friend back home. Cats aren’t forced into yoga poses, which earns the Café graces from People for the Ethical Treatment of Animals (PETA). 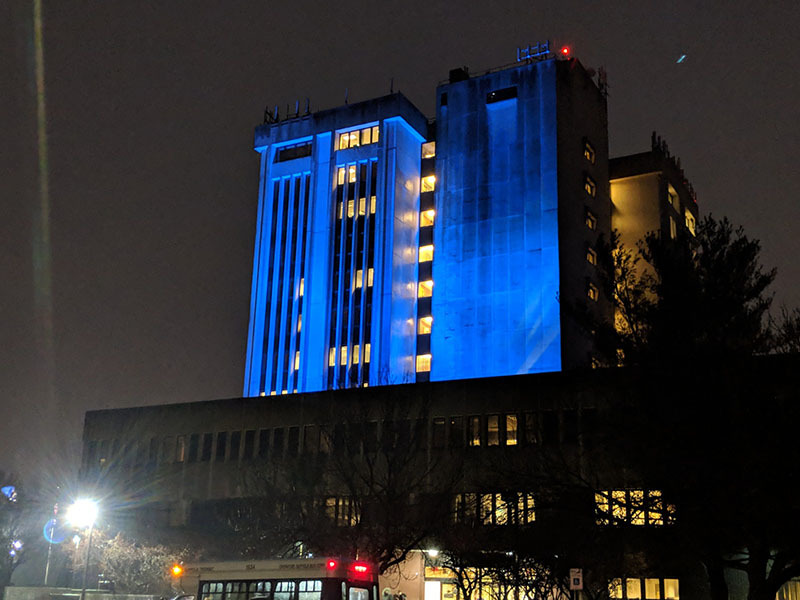 Shea hopes to add more mental health activities in the future. “I’m not completely sure yet but, we might possibly do meditation. Some people really want us to do that,” Shea said.